It depends on your state requirements as to what you’re required to keep for homeschooling records. For our state, all I’m required to keep is a record of my hours and what curriculum I used and that’s it. Legal Docs: ie “Notification of Intent to Homeschool” or enrollment in an umbrella school, etc. Receipts: I keep all receipts together for things I’ve bought for each school year. We aren’t allowed a tax write off right now, but a girl can dream can’t she? Plus it’s good for budgeting purposes. Lesson Plans : I use my workbox excel sheet as lesson plans and keep these in the Records Binder. I have dividers that separate out the lesson plans for each child. Record Keeping Software: I also use Homeschool Tracker to keep track of our hours, and it will print out all kinds of reports, hours, attendance, grades and lesson plans to name a few. Best part, it’s FREE! (When you go to their website, click on “The Basic Edition” and you’ll be taken to the free version.) Another option, Homeschool Skedtrack, is one that I haven’t used, but a friend recommended it to me. It’s an online record keeping site and is also free. Student Work Binders: I get a 3” – 3 ring binder for each child each year. It has dividers that separate each subject and I file our work in the binder as it’s completed. Ie: tabs for Math, Language, Phonics, Spelling, Art (I only keep stuff that fits), Science; Handwriting. Crafts: Most art projects hang around in our room on a clothesline type display, then I toss them as we put up new ones. Harsh I know, but I’m so not a packrat and besides, there are pictures of everything on my blog, so that’s my consolation. I store all of our yearly work binders in the basement on shelves. We’re only up to 2nd grade, so I don’t have too many yet, but eventually…sigh…I’ll probably toss the sweet little stick figures they drew along with the school work. But, for purely sentimental reasons, I’ll probably wait ‘til it’s a space issue. The below binders are 3” binders, they store quite a bit of work. And I keep the current year’s binders on our shelves in our homeschool room for easy access. 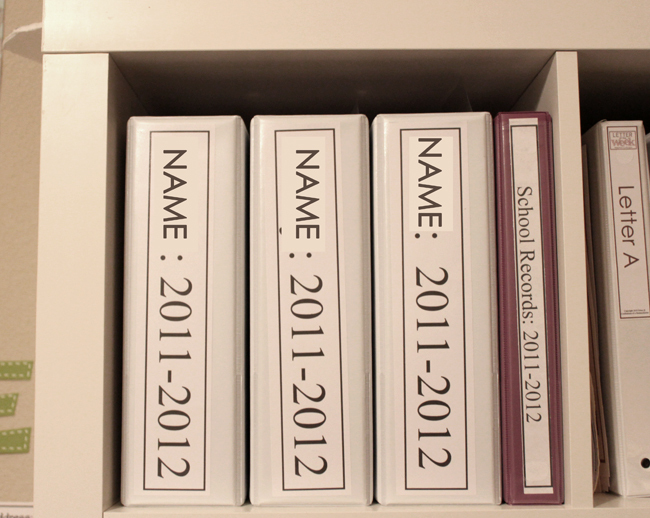 I have the kids put their completed work each day a stack-able file trays. Once those get full…or whenever I think about it... I take the papers and put them into the binders. That way at the end of the year I’m not having to go through mounds of paperwork. So that’s my storage plan, for now anyhow. I’m sure as the amount of bulk increases, and my tolerance for clutter decreases, the binders may start making their way out the door, but until then, they can stay right where they are! You can visit the www.hslda.org website to find out about requirements in your state. Love it. Glad to see there's another person out there like me with a ton of binders. Way to go! We live in PA and are required to do portfolios each year. I'm glad because it's a great record-keeper. I don't use 3-ring binders, though – they take up too much room on our shelves. I bought a comb-binding machine, and we comb-bind our annual portfolios. Amazing Grace: I WISH I had craft storage ideas, that's my summer task list, to organize our crafts, right now our craft cupboards are a disaster! I would like to know how you 'file'/store workbooks that are already bound? Do you put those in the binder whole? Or do you have another spot for them? I hate binders that have loose things in them. We have a lot of workbooks from my senior's lifepac unit studies. Cereal boxes are perfect for storing and organizing these. You can take them apart (there's only one side seem that's usually glued) and turn them inside out, the tape w/packing tape and label. Also we use a plastic bin for art that's oversized. I have to get better at working with binders. It's a work in process but I will get there :-)Thanks for sharing your system. Once again, your a blessing-thanks! !